Yearbook Pre-order and Design Competition! 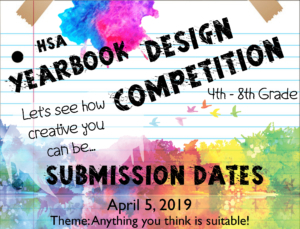 The yearbook competition is a way for your child to show off their creativity! You child can submit anything that is suitable for school. The only limitation is that your student must be in 4th – 8th grade. https://harmonypublicschools.network/hsalubbock-new/wp-content/uploads/sites/124/2019/03/ybcompF.jpg 1024 1343 ssouthard https://harmonypublicschools.network/hsalubbock-new/wp-content/uploads/sites/124/2017/10/HSA-Lubbock-white-letters-300px.png ssouthard2019-03-19 09:31:362019-03-28 12:56:04Yearbook Pre-order and Design Competition!